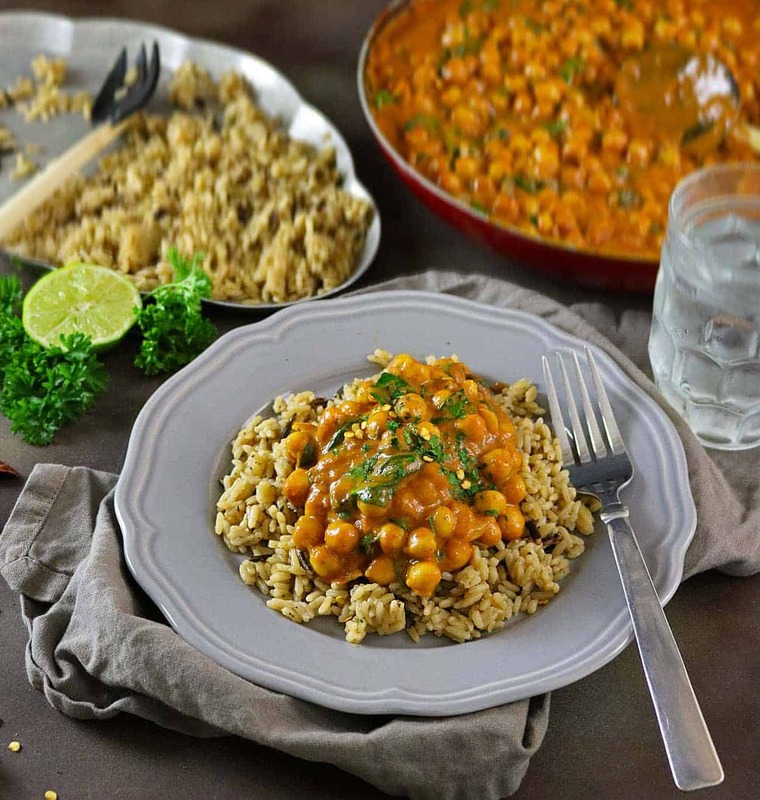 This dairy-free, Chickpea & Spinach Curry is not only simple and easy to make, but it’s tastebud tantalizingly delicious and oh so hearty! When cold, wet and dreary weather forced us indoors during the winter of 2003, my then 5-year-old daughter and I started a “cold-weather” tradition. We would wake up most Saturday mornings, and (even before we brushed out teeth) we’d start the process of bread making. My daughter would help me pick a recipe for a new type of bread and we’d spend a good part of the morning measuring, mixing and kneading (and in her case, bathing in) the ingredients to our latest venture. And, when that loaf emerged from the oven – ahh – the look on her face of pride and accomplishment, why it was simply priceless! However, as she got older and soccer and Tae Kwon Do and homework began to fill our weekends, our little cold-weather tradition was set aside. We’d talk about it fondly from time to time, but that was it. Then, voila, senior year happened on us this year and things seemed to have changed. Instead of just talking about our cooking soirees of long ago, my daughter started bugging me to let her help with our next meal. So, I did one better, instead of just having her help, I decided to play supervisor and guide her on some of the basics of curry making so when she is off on her own, she can whip up a couple of easy curries that will last for days! Most of the curries I make, start off with a standard base of onions, ginger, and garlic sauteed together. For a super simple curry, I add a can of tomato paste and a can of coconut milk to the onion, garlic, and ginger. I vary the spices I use, opting for a mix of coriander, cumin, turmeric, garam masala and/or paprika usually. Then I throw in whatever veggies I fancy and voila – curry in a hurry becomes a reality! The first curry she made all on her own was an Egg Curry that I posted on Instagram not too long ago. Her second was this Chickpea & Spinach Curry! 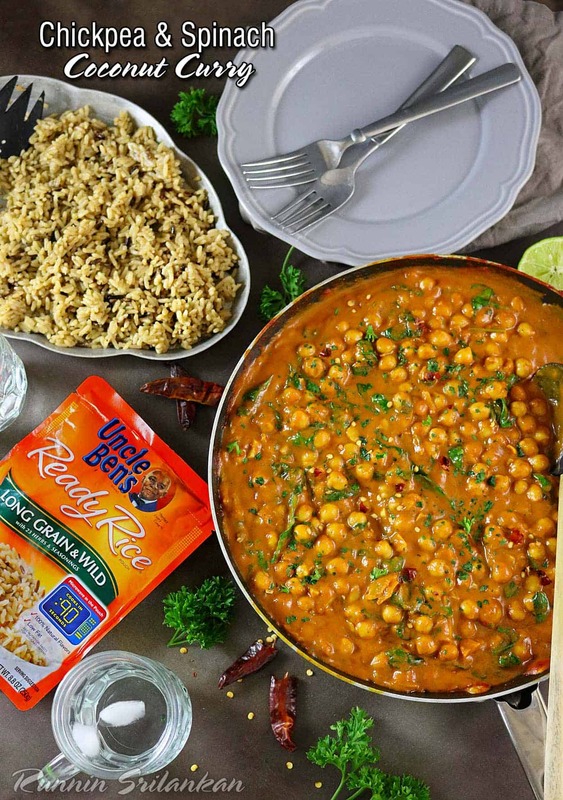 Since we had picked up some packages of Uncle Ben’s Ready Rice from Walmart over the weekend, she suggested we enjoy our quick and easy Chickpea & Spinach Curry with a package of even quicker and even easier, Uncle Ben’s Long Grain & Wild Ready Rice. On crazy busy nights, when I manage to find a container with leftover curry in the fridge, I’m so glad to open my pantry and find a package or two of Uncle Ben’s Ready Rice on hand to enjoy it with. 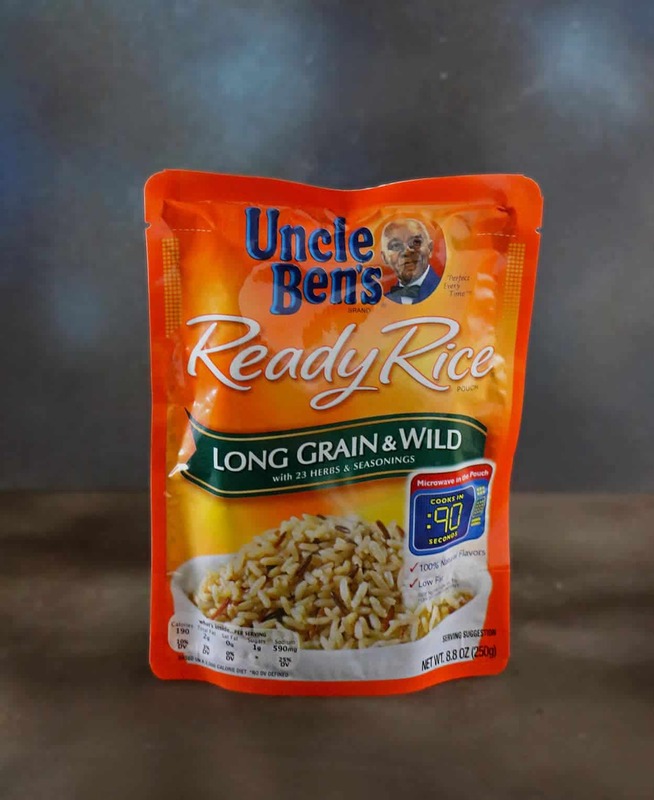 Now when you shop at Walmart, you can get Uncle Ben’s Ready Rice at $0.75 off by taking advantage of this Ibotta offer! For a chance to win 1 of 5, $15,000 prices for your family + a $30,000 cafeteria makeover for your kid’s school, please check out and enter The Ben’s Beginners Program and Contest now! Do you remember the first thing you ever made entirely by yourself? Garnish with parsley/chilies and enjoy with your favorite Uncle Ben's Ready Rice! That’s such a great tradition and it’s wonderful that your daughter has an interest in cooking. 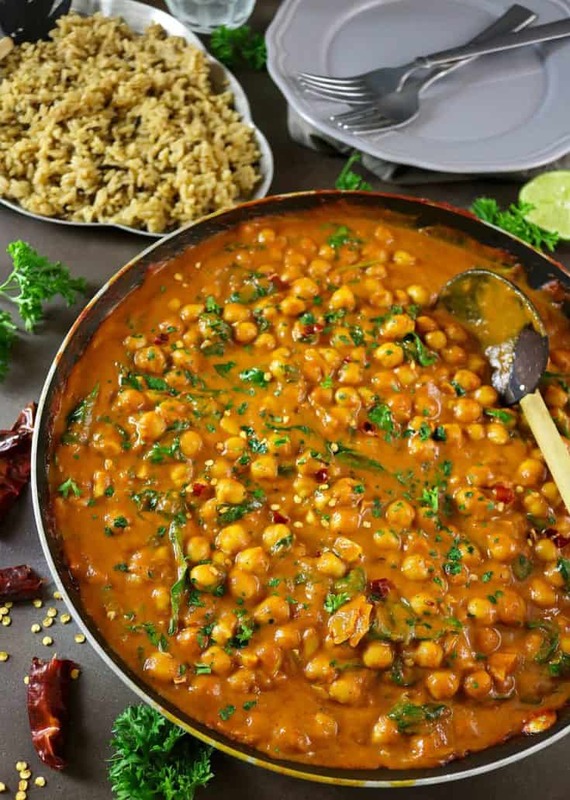 This curry looks so good – hearty and flavorful! Thanks so much for your kind words and for stopping by today, Amy. Wow! What a wonderful “cold-weather” tradition, I should also start this thing with my daughter as she loves spending time with me in the kitchen. Glad that your daughter made this awesome looking curry by herself. I am sure it was fantastic. Lovely share, Shashi. I really enjoy good curry, this looks delicious! I love how quick and simple it is! Haha – David, there’s a restaurant just down the street from that’s called “Curry In A Hurry” – and I think there’s a blog too – or there used to be, so I cannot take credit for it. I cannot wait to see what bread you and Robbie bake up – when Lil Shashi was into bread making, it used to take me longer to clean up the mess from the kitchen AND off her, than it used to take to actually make the bread – but, dude – it was so worth it! And, btw, she has a couple of college’s she’s applying to up by y’all! GAH! Also, btw – thanks so much! Perfect! 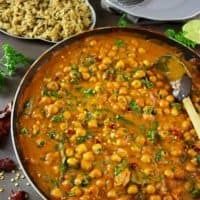 You can’t go wrong with curry and they are so easy to throw together and make! Finally a curry that I can make without being scared with a lengthy list of spices that I have absolutely no idea where to find…and look at that colour…just wonderful! Thanks so much Angie! Actually, when I was in college, one of my sister’s friends told me of an easier curry to make – it involved caramelized onions, a can of diced tomatoes and curry paste! You have me craving a delicious spinach curry so bad right now! 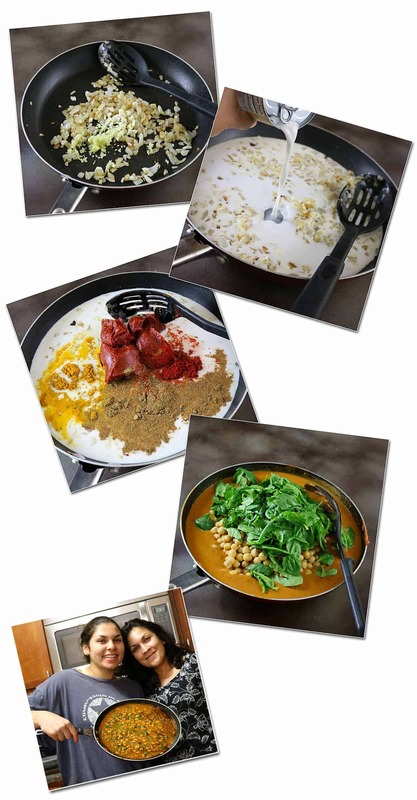 Curry is one of my favorite dishes so I can’t wait to try yours! Even though we’re not vegetarians, I still try to make a couple of veg meals a week, just because they’re so much healthier! Anything curried is always a big hit in our house! We aren’t vegetarians here either – but I do love ’em! Thanks so much Cynthia! What a delicious vegetarian curry!!! Loooove chickpeas as well as the rices from that American brand.